Dr On Mars enjoyed a long career (an uncontrollable lurch downhill, as we in the trade like to call it) in public service before she left for the calmer and altogether redder climes of Mars. To celebrate the something-or-other anniversary of her escape, aka near-death experience, here’s a memory for you. (Former public servants, and meeting attendees of any stripe, please note well and save yourselves before you cross the threshold into a space from which there is no liberation). 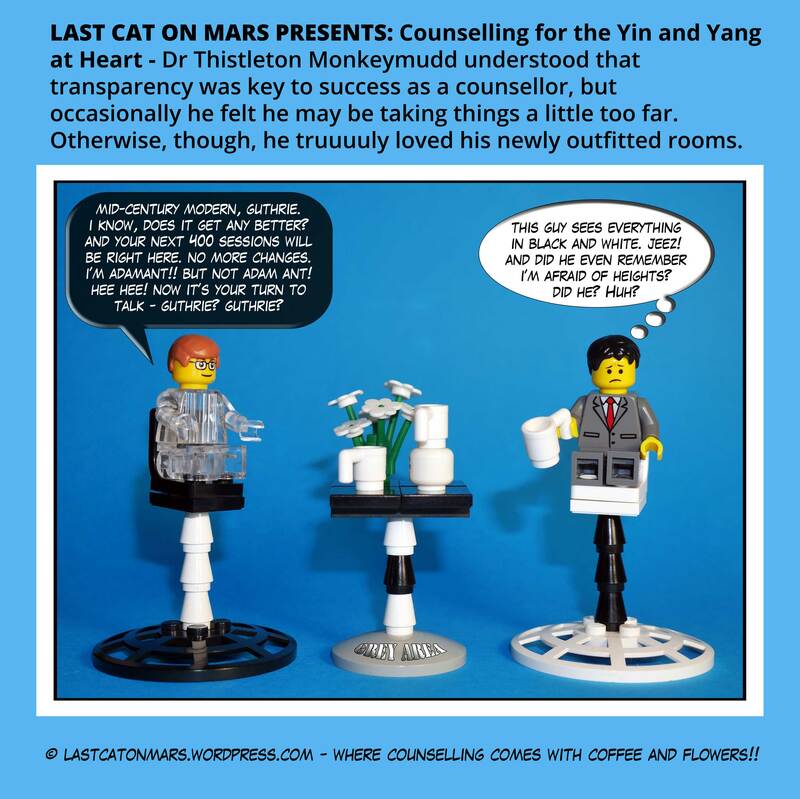 This entry was posted in Workplaces and tagged comic, lego, meeting, minifigures, office, skeletons, windbags, work on April 1, 2016 by Jay Verney. What can it be about water coolers that attracts people, I wonder? Perhaps it’s the cool, blue water (blue?). Perhaps it’s the loveliness of a refreshing cold drink in summer. Perhaps it’s just the irresistible tuna flavour. Whatever it is, I’m queuing up for my turn, and if I learn to conga, samba, salsa, tango on the way, then so be it – I’ll be a fandangoing feline and proud of it. 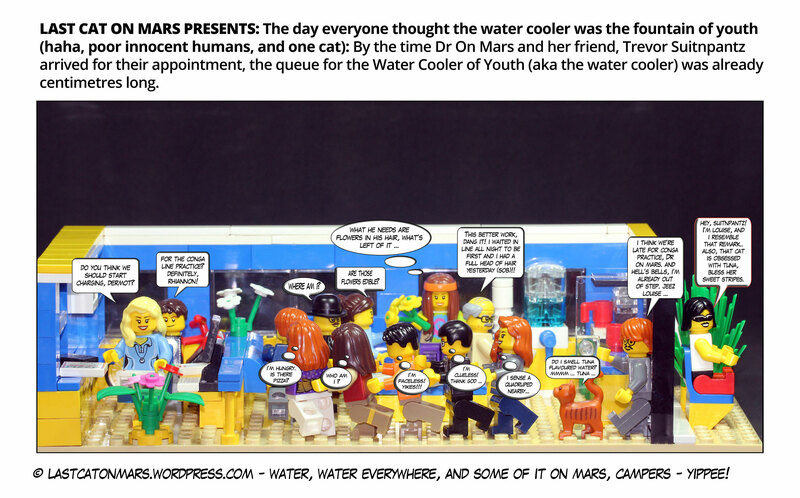 This entry was posted in Variety Show, Workplaces and tagged comic, conga line, Dr on Mars, lego, minifigures, office, water cooler on March 18, 2016 by Jay Verney. 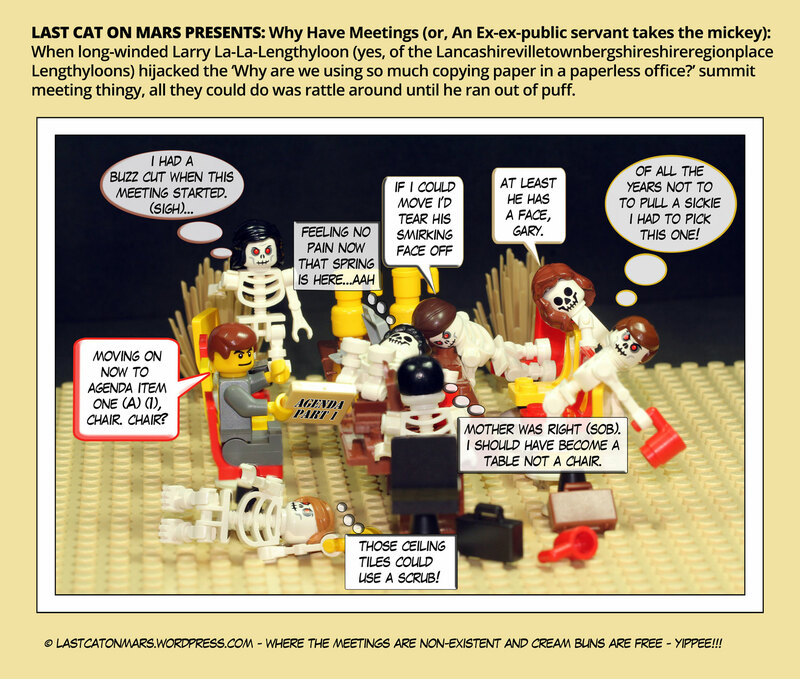 This entry was posted in Workplaces, Zombies and Such and tagged bar, baseball bat, beer, bones, cats, Dr on Mars, katana, Last Cat, lego, minifigures, zombies on March 11, 2016 by Jay Verney.